making and receiving compliments the easy way. 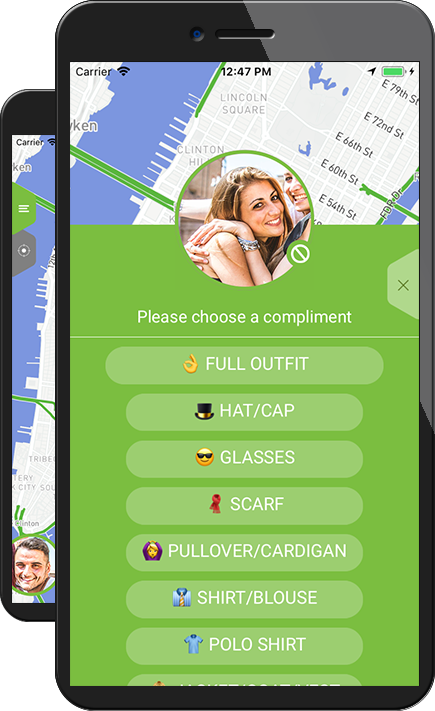 Search the map for the person in your immediate surroundings you wish to pay an anonymous compliment. Choose from the categories body, clothes, and charisma. After receiving a compliment, you may express your gratitude. In the statistics, among other things, you can access your history of compliments. NEW: "beam" you to any place in the world. March 1, 2018 (World Compliment Day). How does CMPLMNTS earn money? WWe don’t have monetarization models applied at the moment. If that changes in the future, we’ll transparently inform our users. On a map you can see everyone in your immediate surrounding, approx. 25m around you. If someone attracts your attention, you can pay them an anonymous compliment. Click on their picture at the bottom of the app and chose a personal characteristic from the categories “body”, “outfit”, or “charisma”. The complimented user will receive a notification. Of course, you can pay multiple compliments from different categories. How do I log in and which information is needed? We only need very little personal information, as we solely identify you with your smartphone. We neither ask for your name nor your country. What we do need is a recent picture for your profile to make you recognizable for other users, as well as your location, so that you can receive compliments at any time. If you like, you can add your age and gender to your profile, which will be visible for the people you compliment. Why is my face visible? The picture should only display what the people around you can see anyway. It’s necessary, however, to ensure that the right person is complimented. The people receiving your compliments don’t learn anything about you, unless you’ve added your age or gender to your profile. What is Yiggles and what do I need it for? Yiggles is the CMPLMNTS point system. You need Yiggles to unlock your received compliments. You can earn Yiggles by paying compliments, inviting friends, and using the app daily. You know you can "beam" to any place in the world? To do so, simply enlarge a cloud to the extreme and then press your finger on the middle of the cloud for a long time and you are in LA or anywhere else in the world!